Looking for past editions ? Download all previous volumes of the journal. Click here. Accidental myiasis by Ornidia obesa in humans. MONTEIRO, S.G.; FACCIO, L.; OTTO, M.A. ; SOARES, J.F. ; SILVA, A.S. DA; MAZZANTI, A.
Nematode resistance to five anthelmintic classes in naturally infected sheep herds in Northeastern Brazil. Silva, F. F. da. ; Bezerra, H. M. F. F.; Feitosa, T. F.; Vilela, V. L. R.
Looking for the list of most viewed articles from all time? Click here. What is known about Tritrichomonas foetus infection in cats?. Bastos, B., F.; Almeida, F., M., de; Brener, B.
Contracaecum larvae: morphological and morphometric retrospective analysis, biogeography and zoonotic risk in the amazon. Pinheiro, R., H., da S.; Furtado, A., P.; Santos, J., N., dos; Giese, E., G.
Microscopic alterations in Fasciola hepatica from sheep treated with albendazole. Carneiro, M., B.; Avelar, B., R.; Archanjo, A., B.; Martins, I., V., F.; Nunes, L., de C.; Scott, F., B.
Helminths Assemblage of the bare-faced ibis, Phimosus infuscatus (Lichtenstein, 1823) (Pelecaniformes: Threskiornithidae), in southern Brazil. 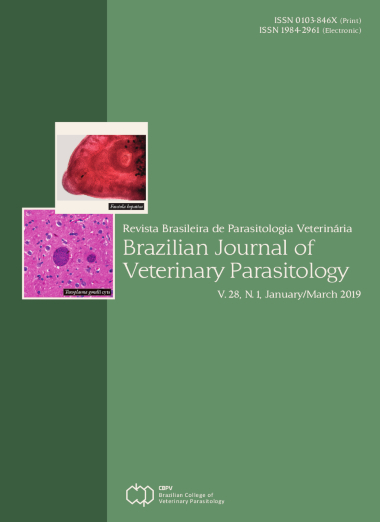 Scheer, S.; Mascarenhas, C., S.; Macedo, M., R., P., de; Muller, G.
Frequency and factors associated with Theileria equi, Babesia caballi and Trypanosoma evansi in equids from Bahia (Northeast Brazil). Costa, S., C., L.; Freitas, J., de S.; Silva, A., N., da; Lacerda, L., C.; Cruz, R., D., S.; Carvalho, F., S.; Pereira, M., J., S.; Munhoz, A., D.
Comparative morphometric evaluation of hepatic hemosiderosis in wild Magellanic penguins (Spheniscus magellanicus) infected with different Plasmodium spp. subgenera Avaliação morfométrica comparativa da hemossiderose hepática em pinguins-de-Magalhães. Ewbank, A., C.; Strefezzi, R., de F.; Sacristán, C.; Kolesnikovas, C., K., M.; Martins, A.; Mayorga, L., F., S., P.; Vanstreels, R., E., T.; Catão-Dias, J., L.
Occurrence of zoonotic Enterocytozoon bieneusi in cats in Brazil. Prado, J., B., F.; Ramos, C., A., d., N.; Fiuza, V., R., da S.; Terra, V., J., B. Exposure of Toxocara canis eggs to Purpureocillium lilacinum as a biocontrol strategy: an experimental model evaluation. Filho, F., de S., M.; Fonseca, A., de O., da S.; Valente, J., de S., S.; Baptista, C., T.; Moreira, A., da S.; Botton, S., de A.; Pötter, L.; Pereira, D., I., B.
Ultrastructure of phagocytes and oocysts of Nematopsis sp. (Apicomplexa, Porosporidae) infecting Crassostrea rhizophorae in Northeastern Brazil. Silva, T., J.; Soares, E., C.; Casal, G.; Rocha, S.; Santos, E., L.; Nascimento, R.; Oliveira, E.; Azevedo, C.
Differences in protein expression associated with ivermectin resistance in Caenorhabditis elegans. Sousa, D., M.; Cunha, N., M., F., da; Silva, D., R., da; Aragão, P., de T., T., D., de; Aguiar, M., V., de A.; Lobo, M., D., P.; Moreira, A., C., de O., M.; Cunha, R., M., S., da; Miranda, R., R., C., de; Bevilaqua, C., M., L.
Toxoplasma gondii and Neospora caninum infections in synanthropic rodents from Argentina. Dellarupe, A.; Fitte, B.; Pardini, L.; Campero, L., M.; Bernstein, M.; Robles, M., d., R.; Moré, G.; Venturini, M., C.; Unzaga, J. M.
Helminthic infection in three native rodent species from a semiarid Mediterranean ecosystem. Yáñez-Meza, A.; Landaeta-Aqueveque, C.; Quiroga, N.; Botto-Mahan, C.
Antitumoral effects of Amblyomma sculptum Berlese saliva in neuroblastoma cell lines involve cytoskeletal deconstruction and cell cycle arrest. Nascimento, T., G., d.; Vieira, P., S.; Cogo, S., C.; Dias-Netipanyj, M., F.; Junior, N., de F.; Câmara, D., A., D.; Porcacchia, A., S.; Mendonça, R., Z.; Moreno-Amaral, A., N.; Junior, P., L., de S.; Simons, S., M.; Zischler, L.; Elifio-Esposito, S.
Dermatitis in humans caused by Ornithonyssus bursa (Berlese 1888) (Mesostigmata: Macronyssidae) and new records from Brazil. Bassini-Silva, R.; Jacinavicius, F., de C.; Hernandes, F. A.; Ochoa, R.; Bauchan, G. R.; Dowling, A. P. G.; Barros-Battesti, D., M.
Detection of a putative novel genotype of Ehrlichia sp. from opossums (Didelphis aurita) from Brazil. Guimarães, A.; Raimundo, J., M.; Silva, A., T., da; Carpintero, F., M.; Pires, J., R.; Benevenute, J., L.; Machado, R., Z.; André, M., R.; Baldani, C., D.
Histopathological findings of Fasciola hepatica infection in non‑native European hare (Lepus europaeus) in Southern Chile. Oyarzún-Ruiz, P.; Alvelo, C.; Vera, F.; Moroni, M.
Occurrence of Ehrlichia canis and Hepatozoon canis and probable exposure to Rickettsia amblyommatis in dogs and cats in Natal, RN. Lopes, M., G.; Krawczak, F., da S.; Lima, J., T., R., de; Fournier, G., F., da S., R.; Acosta, I., da C., L.; Ramirez, D., G.; Marcili, A.; Labruna, M., B.; Gennari, S., M.
Neobenedenia melleni (Monogenea: Capsalidae) in ornamental reef fish imported to Brazil. Cardoso, P., H., M.; Balian, S., de C.; Soares, H., S.; Tancredo, K., R.; Martins, M., L.
First report of antibodies to Neospora spp. in horses from Portugal. Cruz, I.; Vinhas, A., R.; Dubey, J., P.; Cardoso, L.; Cotovio, M.; Lopes, A., P.
Flukicide efficacy against Fasciola hepatica of Triclabendazole and Nitroxynil in cattle of the central valley of Chile. Romero, J.; Villaguala, C.; Quiroz, F.; Landaeta-Aqueveque, C.; Alfaro, G.; Pérez, R.
Use of Mini-FLOTAC and Fill-FLOTAC for rapidly diagnosing parasitic infections in zoo mammals. Capasso, M.; Maurelli, M., P.; Ianniello, D.; Alves, L., C.; Amadesi, A.; Laricchiuta, P.; Silvestre, P.; Campolo, M.; Cringoli, G.; Rinaldi, L.
Seroprevalence of Toxoplasma gondii and Leishmania spp. in domestic donkeys from Portugal. Rodrigues, F., T.; Pereira, C.; Dubey, J., P.; Nóvoa, M.; Quaresma, M.; Schallig, H.; Cardoso, L.; Lopes, A., P.
Ticks in wild animals at a resort and the first documentation of Amblyomma sculptum infesting Emu (Dromaius novaehollandiae). Araújo, I., M.; Magalhães-Matos, P., C.; Cordeiro, M., D.; Pacheco, A.; Rocha, B., S.; Feitoza, L., F., B., B.; Sanavria, A.; Fonseca, A., H.
Ehrlichia spp. infection in domestic cats from Rio de Janeiro State, southeast Brazil. Guimarães, A.; Raimundo, J., M.; Rodrigues, R., B.; Peixoto, M., P.; Santos, H., A.; André, M., R.; Machado, R., Z.; Baldani, C., D.